Over 100,000 scoops of FREE ice cream at Ben & Jerry's FREE CONE DAY! Who Will Be The Discovery Intern? Rydges South Bank rolls out the magic carpet to welcome Aladdin to Brisbane! The Lonely Hearts Club "GALentine's Day"
Music in the House to honour Archie Roach! Are You Discovery's Next Global Intern? Debate Series To Ask: Is Australia In 2017 Still A Man's World? Oktoberfest Comes to Melbourne . 365 Days a Year! Trailblazing 21 year old multi-instrumentalist and producer, Ukiyo returns today with his transcendent new single Go, featuring breathtaking vocals from Chymes, out today, April 18. Ukiyo, otherwise known as Timothy Arnott, has also dropped an exquisite video to accompany the track; a meditative amalgamation of vision capturing the beauty of the Austrian Alps. 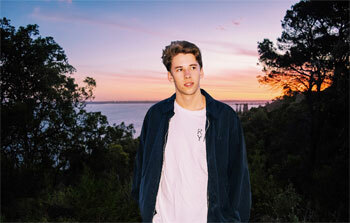 The exciting Perth local has also announced a string of hometown shows, including the renowned festival, Groovin' The Moo in Bunbury on May 12, and Art Ball in Perth on May 26. Go moves mountains with subtle, assertive ease; modern, exciting production moulds itself around organic, reassuring piano, and that sweet, intimate vocal sits atop the arrangement like a queen upon a throne. The track is evocative of Flume's groundbreaking production style, but there is something distinct about Go that is incomparable to others within the genre. Thoughtful and introverted, Go is the result of a contemplative plane trip, as Timothy explains, "Go was a track that came about after my first Melbourne show last year. It was my first Ukiyo show outside of my hometown and the first time I'd flown for ages. Being up there is always a harsh reminder of how small we are.. the idea was centred around a feeling of adventure and the possibility of happiness out of sadness. It's about fixing relationships, whether that be with yourself, someone you love, or something you love." The music video for Go is suitably meditative and magnificent all at once. Aerial shots of the Alps in Austria fill the screen and warp, twist, invert - it's hypnotic and kaleidoscopic, but in a comforting, cyclical way. Directed and shot by the artful Kevin McGloughlin with creative direction and colouring from Brendan Canty, it is truly a wonderfully apt visual representation of the music as it unfolds. Reflecting on the process, Timothy says, "My biggest inspiration for music is always nature, so when it came around to a video clip for Go, I knew the only actor I wanted was the Earth," as Kevin adds, "I aimed at evoking a sense of atmosphere and adventure while complimenting the beauty of the track, to express a feeling of exploration, and create a calming journey for the viewer…it was an absolute pleasure to work on this project." 2018 is set to be a massive one for this exciting young artist, but he's taking it all in his stride – major festival appearances and all. Ukiyo says, "Expect some new sounds & directions this year, and Go is just the beginning."